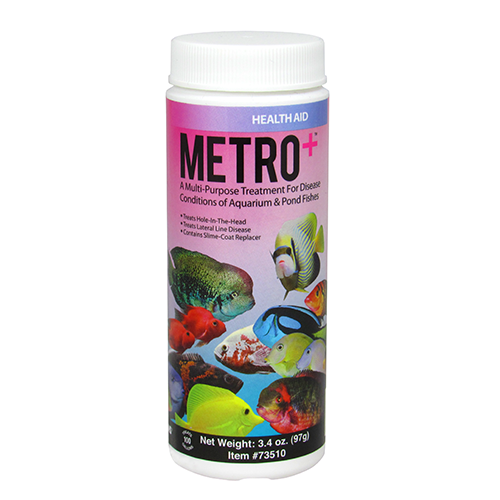 For treatment of praziquantel-susceptible disease conditions in pond, freshwater and marine aquariums and ornamental pond fishes. 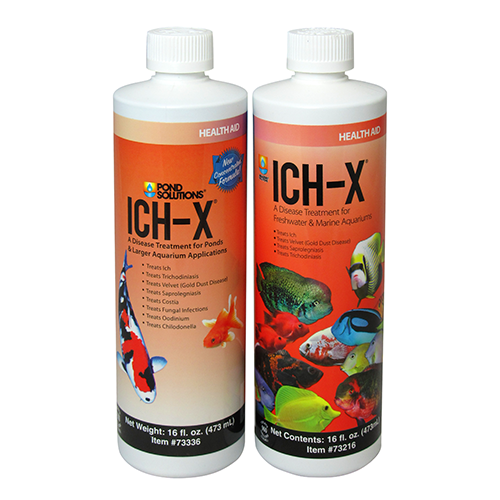 Start treatment with as large a water change as practical or start with new water. Any water used should first be conditioned with Ultimate® or a combination of Liquid Buffered ClorAm-X® and Stress-X™ to remove ammonia, chlorine and chloramines. Do not stop filtration, but remove activated carbon and stop foam-fractionation (protein skimming) and UV sterilization-failure to do so will render product ineffective. SHAKE VIGOROUSLY before use. Measure Liquid PraziPro® at the rate of one (1) teaspoon (~5mL) per 20 (76L) gallons of water to be treated (one  fl. oz. [29.5 mL] per 120 gallons [454L]). Care should be taken to treat the exact amount of water in the system. This means deductions for substrate, rock or coral and any other internal equipment is necessary. You can calculate the amount of water in your aquarium by taking a measurement of the length x width x depth of the area with water and dividing by 231 for approximate volume. 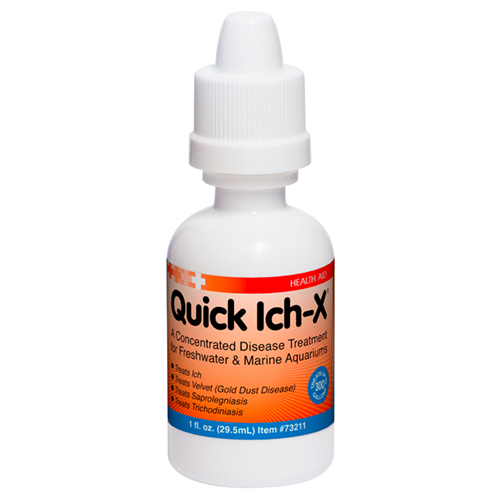 This produces a concentration of 2.5 mg/L. 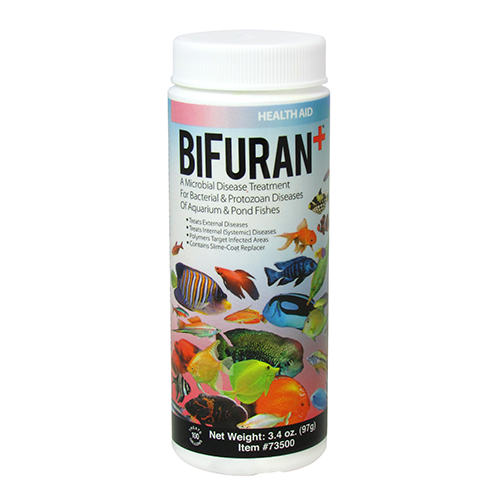 Distribute the proper amount around the edge of the pond or aquarium or directly in to the filter box to achieve the best overall distribution. A single treatment lasting 5-7 days may be sufficient. Retreat as necessary, but no more than once every 3 days. May be used as a preventative, at the standard dosage, when disease is likely. Do not use with any other drugs or disease treatments. May cause noticeable temporary foaming. It's important to note that most parasites in the class that PraziPro® would be used for have up to a 28 day life cycle. This means for major issues, up to four (4), uninterrupted treatments may be required to resolve the issue.Over dosing will not speed impact. 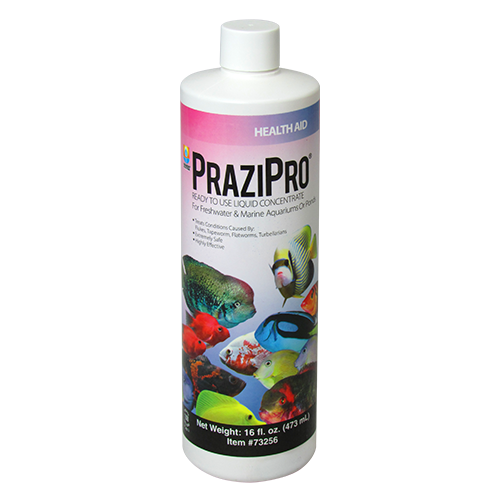 Use Liquid PraziPro® any time unwanted parasites are noticed or introduction is probable. Compatibilities: There are no known compatibility issues with the use of Liquid PraziPro® except for use in marine (saltwater) systems where flatworms of the Polycladida order are being cultured and when used where feather duster worms (sabellidae) or delicate worm-type relatives are kept. For heavily stocked aquariums or marine aquariums with lots of coral, added aeration is suggested. 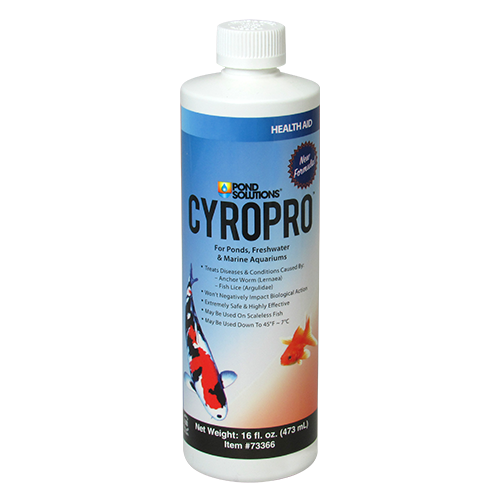 Because we care: PraziPro® has been developed to offer assistance to aquarium or pond keepers who are encountering problems with unwanted worms or parasites and for ease of use by the user. CAUTION: In case of contact with eyes, rinse immediately with plenty of water for at least 15 minutes. In case of skin contact, wash with soap and plenty of water. If swallowed, rinse mouth with water (only if person is conscious). Immediately obtain medical advice.